The Appalachian Trail is the single longest trail to be exclusively hiked on foot, and to date, less than 15,000 people are known to have successfully hiked across its entire expanse. You may not plan on taking a year off to walk across 14 states, but if you want to comfortably enjoy even a single weekend on any trail, then it’s vital to pick the right hiking backpack for the expedition. 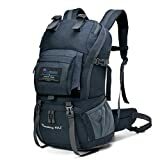 The following backpacks have been chosen as some of the best choices for making a hiking escapade as successful as possible. The TETON Sports Scout 3400 is outfitted with bungee stash storage compartments on the top and front. The compartments can store various hiking essentials such as jackets, shoes, and ropes. In addition to the storage compartments on the front and top of the bag, there is also a compartment specially made for a sleeping bags that the hiker may access with a front zipper. For the convenience of carrying water bottles and snacks, the bag features mesh pockets and zippered pockets on both sides. Hikers have the ability to maintain the coolness of their water bladders with a padded pocket implement in the bag’s main compartment. There are tube clips on the right and left side of the bag that can be flexibly adjusted to meet the user’s preferences. The Sports Scout 3400 does not come with a water bladder included. In order to secure the hiker’s sleeping bag, sleeping pad, or tent, the Sports Scout 3400 features compression straps on both the side and front. The bag’s torso length is made to be adjustable from 15” to 19.5”. Pliable aluminum strays give the Sports Scout 3400 a slightly higher degree of overall durability. Customers have testified that they were surprised at the comfort of the bag, given its robustness. The bag’s comfort is made possible in large part by padded shoulder straps. As a safety measure, the bag includes a safety yellow rainfly implement. The safety yellow rainfly stays hidden until the owner decides to take it out and protect their pack from the elements. To keep the main compartment closed securely, there are two drawstrings that are secured with barrel-locks. The pack has been designed with gear loops that hikers may use to store various environment-specific tools, such as ice axes, shovels, or ski poles. Thanks to a top carry-loop, the Sports Scout 3400 is relatively easy to load into a car with a comfortable grip. The Sports Scout 3400 is measured at approximately 3.94” x 16.93” x 29.92”, with a weight of approximately 4.5 pounds. The bag’s overall size is 3400 cubic inches, and it has a liquid capacity of equivalent 84 fluid ounces. The primary material of the bag is polyester. It is available in one of two different color variations: Hunter Green and Mecca Orange. Overall, the Sports Scout 3400 is a medium-sized bag. While the bag is not large, customers have testified that it is capable of carrying a sleeping bag that can accommodate hikers who are as tall as 6’4”. Some customers advise that it might be more prudent to carry the sleeping bag on the outside of the Sports Scout 3400 as opposed to the interior. On average, the bag can be used to comfortably transport up to 30 pounds of weight in supplies. Taking the measurements into account, the main compartment is capable of holding at least two shirts, one pair of pants, two pairs of underwear, two socks, and miscellaneous essential hiking supplies. The side compartments of the bag may be effectively used to carry maps, utensils, water treatment, alcohol fuel, lighters, stoves, and other items of convenience. Depending on the volume of food containers that the hiker brings on their trip, the bag may potentially be capable of storing up to five days of rations. The recommended size of first-aid kit for a hiker that plans on using the Sports Scout 3400 would be approximately 6 x 4 inches. The standard price for the Hunter Green version is $129.99, though an applicable discount can reduce the purchasing price to $59.99. The Mecca Orange variation of the Sports Scout 3400 is available for $65.00. When compared to other high-end hiking bag choices that possess similar features, the Sports Scout 3400 is a relatively affordable selection. Customers who purchase the Sports Scout 3400 will be granted a lifetime warranty. The manufacturers’ limited lifetime warranty is applicable to imperfections found in either the bag’s construction or material integrity. Only the original owner of the bag is entitled to the coverage of the limited lifetime warranty, and it covers normal damages from the wear and tear of extended ownership. Should the zippers of the bag eventually wear out, then users are entitled to have repairs or a replacement request honored without incurring any costs aside from duty fees and shipping expenses. The benefits of limited lifetime warranty for the Sports Scout 3400 will only be applied if it is determined that wear and tear to the bag did not occur as a result of damages caused by user negligence or mishandling. The Naturehike is an outdoor bag that was intended for low-weight expeditions. The bag’s straps are lightened to give the owner more comfort on extended hikes. The bag features a helmet net that may be appealing to those with an interest in off-road cycling. While the bag is small, the interior leaves a sufficient amount of utilization space for storing clothes and supplies. There are thin pockets of assistant storage space for storing miscellaneous lightweight items. The bag has a mesh pad incorporated into the rearmost section to facilitate more air flow. There is a small-sized pocket in the front of the bag that can be used for storing items such as compasses and smartphones. The bag’s external measurements are 50 x 33 x 18 inches, and the inner spatial dimensions of the Naturehike bag are 11.81 x 2.76 x 9.45 inches. The bag’s weight is approximately 0.85 pounds. Customers testify that, for its size, the Naturehike is a dependable bag for its intended purpose. Some owners do advise potential buyers, however, that the storage space is not meant to accommodate the same volume of hiking materials that one might expect to bring on an expedition that could last several days on end. 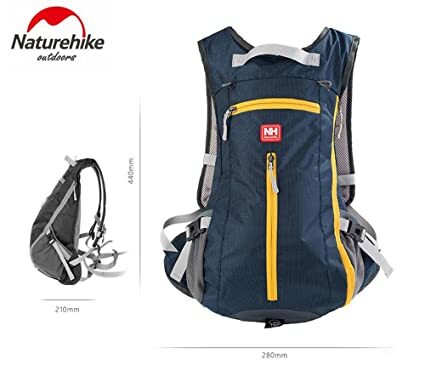 As a lightweight nylon bag, the Naturehike is most suitable for hikers who intend on merely making a consistent number of day hikes, rather than extended hikes on serious mountain campaigns. The average inventory of a person who brings a Naturehike bag on the trail would typically equate to the space occupied by a water bottle, face towel, keys and possibly a snack. There is enough room to cover the bare essentials, but anything else would be more practically accommodated by a bag of a larger size. On the other hand, some customers have suggested that the bag’s small size could actually help prevent the others from the temptation of over-packing, a common mistake made my some less-experienced hikers who bring larger bags on the trail. What owners are particularly fond of the bag for is the dependability of the nylon. The bag’s material is highly resistant against wind-accelerated rain, which can ensure that moisture-sensitive items in the owner’s pack won’t immediately be jeopardized by a sudden shower on the trail. It should be noted, however, the Naturehike’s zippers are not as waterproof as the bag’s nylon surface material. Because of the lightweight and inconspicuous design, many owners are just as comfortable wearing the Naturehike during casual walks through cities as they are bringing the bag with them on hiking escapades. The bag’s small size also makes it acceptable to be brought onto planes as a carry-on item. The Naturehike bag is available five different color variations: Dark Blue, Black, Light Blue, Orange, and Rose Red. 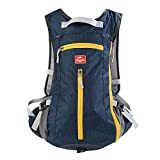 The price range for all five different color variations of the bag is between $18.97 and $22.50, making it one of the most economically-priced hiking bags on the market. The Mountaintop 40L backpack will please hikers who like to carry a diverse set of gear. 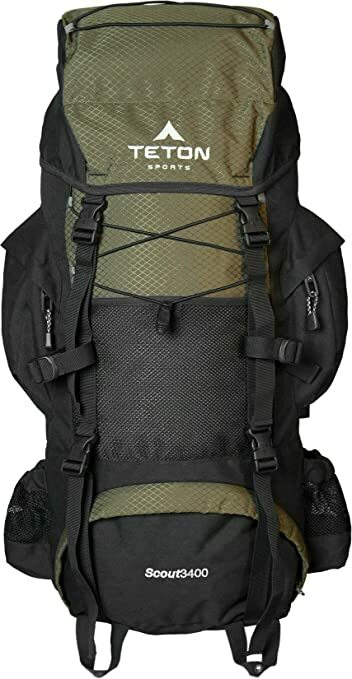 The backpack is made with six adjustable straps that can be used for a variety of purposes such as hanging a sleeping bag, mat, hammock, tripod, or any other variety of heftier cargo. The bag was made with a particularly generous amount of padding. The shoulder straps were intentionally made with increased density to provide more cushioning and support for comfort during longer hikes. 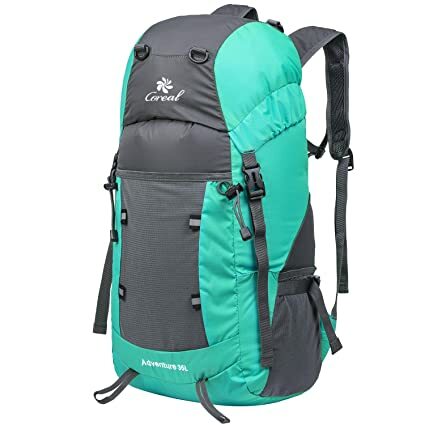 In addition to the ergonomic shoulder pads, the backpack also features two sections of heavily-padded cushioning on the rear to provide the hiker with back support. The rear cushioning not only lessens the physical strain on the hiker’s back, but also serves the purpose of providing a more optimal circulation of air to the shoulders. To more evenly distribute the weight of heavy carrying loads, the Mountaintop 40L has a built-in hip-belt. 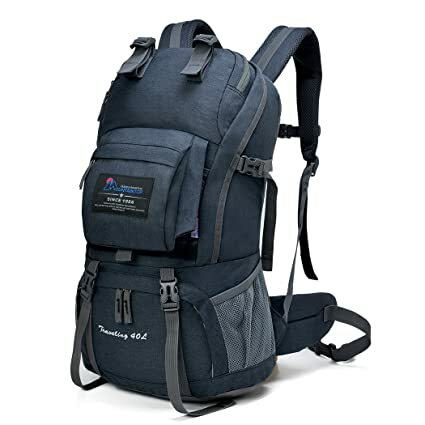 There are two front pockets in the backpack’s front to increase the carrying capacity for miscellaneous small items, along with a hidden compartment. There are two mesh pockets on either side of the bag that can be used for carrying snacks and/or water bottles. The main compartment of the bag is outfitted with organized sleeves that can each accommodate individual items in a manner that makes them easier to access without too much sifting. Both the right and left side of the back have attachment points in the form of d-shaped hooks, which can be convenient for hooking on additional miscellaneous items that aren’t stored into the bag’s interior. The front straps of the pack are adjustable and can be used to carry hanging tripods or trekking poles. The bag comes outfitted with a number of cinch straps on the bottom, side and top that can be effectively used for strapping down towels and similarly-sized items. The primary material of the Mountaintop 40L is waterproof Polyester, giving all inner contents some security against precipitation or possible spills into creeks or wet plants. As the bag is made with a water resistant coating fabric, owners are discouraged from washing the bag with any kind of liquid detergent or bleach. It is advised the customers clean it only with a damp cloth, if deemed absolutely necessary. Air drying should be the only form of drying, and the bag should not be ironed. The dimensions for the Mountaintop 40L are 20.1 x 6.3 x 13.8 inches, and it weighs approximately 2 pounds. The carrying capacity of the pack is around 40 liters altogether. Customers have testified that the bag’s overall size is slightly larger than that of a standard school backpack, but still satisfyingly roomy for the storage of small items. Customers have also testified that the bearing strength of the hip-belt may vary, depending on what the user carries and how far they intend on hiking with their pack on any given expedition. Most owners have expressed that the medium-sized pack is best-suited for mid-scale hiking expeditions. The Mountaintop 40L is a fair bit roomier and robust than the most lightweight hiking packs, but it’s not quite large and robust enough to fully accommodate the heavy-duty needs of serious trek through the mountains that could take several days or weeks. The Mountaintop 40L is available in 9 different color variations, including: Black, Blue, Fuchsia, Gray, Khaki, Orange, Pink, and Sky-Blue. The price for all different color variations of the pack is approximately $40. Every individual pack comes with limited 90-day warranty for any defects in its material or structural integrity. The Coreal Large 35L backpack is made to contain a proportionally high amount of durability for its lightweight frame. While it isn’t a large and robust bag by any means, the Coreal Large 35L has satisfying potential for long-term performance. The bag’s survivability is owed to the nylon material, making it resistant to sudden rips from stress or water exposure. The bag provides enough interior space for hikers to store a number of items roughly equivalent to a hammock, a change of clothes, a towel, and a water bottle. There is a convenient fabric divider inside of the bag’s main compartment, which is affixed to the top of the bag with a double-sided pouch that the owner can use to store additional small items. The double-sided pouch is attached to the top of the bag with an adjustable strap, allowing the user to freely tighten or loosen up the pressure at their leisure. The exterior top pouch is easily accessible, which allows owners to access small handheld items such as cell phones, sun block and digital cameras. There is also an exterior pouch on the front of the bag that can be used to store slightly bigger items than the exterior top pouch can. To increase the bag’s overall carrying capacity beyond what’s allowed by the compartments and pouches, there are two hooked straps and two spandex straps that owners can use to hang additional items off of the sides. To make the bag slightly more ergonomic, the straps are padded and feature chest clips for better weight distribution. The key feature of the Coreal is its ability to be folded into a size that’s compact enough to fit into a small carrying pouch, making it a more convenient carrying method than the typical duffel or tote bag. Overall, it could be described as an adjustable hybrid between a hiking backpack and a compact carrying case. The bag’s folded measurements are 9” x 7”, and when unfolded, the measurements expand to approximately 21.56” x 11” x 7.87”. The bag only weights about 0.7lb, and the interior storage space amounts to around 35 liters. Because of the bag’s foldability, owners can potentially avoid unwanted overweight airline charges by removing it from their luggage and using it as carry-on item. As a small-to-mid-sized bag, the Coreal can be equally effective for both casual day-to-day travel or lightweight day hikes on the trail. Some owners testify that they can use the pack as a convenient way to carry around cameras and school supplies. The Coreal Large 35L is available in 8 different color variations, including: Black, Blue, Green, Lake Blue, Light Green, Orange, Pink, and Purple. As you hike along the trail, your backpack’s padding will become increasingly important for offsetting fatigue. Even if the pack’s weight isn’t necessarily overwhelming, several hours on the trail can eventually lead to even a mid-sized pack putting a great deal of stress on the shoulders and hips. Far too many hikers make it out halfway along the course of their trail before realizing that their padding isn’t sufficient enough to prevent painful friction burns and muscle cramps. Whenever selecting a pack, make sure that there’s a generous amount of cushioning in the shoulder straps and hip belt – if the padding is optimal, then the feeling of carrying the bag should be consistently comfortable from start to finish. Pivoting hip belts will keep the bag from swaying to and fro as you move, which can be valuable for maintaining balance. If the hip belt has pockets for storing accessories, then you’ll be able to access snacks and water reservoirs without needing to completely remove the bag altogether – not only will this be more comfortable, but it will also save valuable time. Make sure to measure up the material of the bag alongside the climate of the trail that you’ll be hiking. Polyester fibers are exceedingly strong, making them popular for the level of endurance they show on particularly rugged trails. Polyester is a hydrophobic material, which allows it to dry relatively quickly. Nylon material is slightly more expensive to produce than polyester, but it also tends to be more weather-resistant as well. Generally speaking, packs that incorporate lightweight mesh into the material will provide a more comfortable carrying experience in hotter climates. Generally speaking, there are two different ways that hiking backpacks can provide you with quick access to water; a side pocket for carrying a water bottle, or an attachable water reservoir. Most backpacks will have some form of side pocket for water bottles, but not all backpacks are compatible with water reservoirs. Backpacks that do feature compatibility will generally provide about 13 liters of fluid capacity in total. Backpacks that can be attached to water reservoirs will usually have a special sleeve that the reservoir can snugly slide into so that you can always reach the mouthpiece easily. The immediate accessibility of the reservoir can be quite useful for staying on the move and keeping your hands free, but at the same time, reservoirs are not always foolproof. Keeping a water bottle in the side pocket will generally provide you with a smaller margin of error, and on top of that, water bottles are also easier to fill up at the filter. If you want to cover all of your bases, then you might find it prudent to invest in both a water bottle and a water reservoir at the same time. Think about your bag’s capacity not only in terms of how many supplies it can carry, but also how the capacity will play into transporting the bag itself. Standard US airlines have an overhead bin size of roughly 22” x 14” x 9” – naturally, some bags are going to be more suitable for these spatial constraints than others. Consider whether or not you’re going to need to carry overnight gear with you, as this will generally mean that you’ll require at least 35 liters of carrying capacity to accommodate the daytime and overnight supplies. The length of the trip will play into the necessary capacity for the bag you choose as well. A trip that last several months will require different carry capacity needs than a trip that will be started and completed within a single weekend. An overnight trip will generally demand around 20 to 50 liters of pack capacity, weekend trips will be in 50 to 60-liter range, multi-day trips will be at the 60 to 80-liter range, and extended trips may require a gross total of liter capacity in the triple digits. As a fail-safe, it may be wise to invest in two different packs with different carrying capacities to accommodate the heavy supply needs of longer hiking adventures. Depending on where you choose to hike, the pack’s facilitation of proper airflow could be a highly important feature to consider. Lightweight mesh material is popular choice for hikers who plan on taking expeditions through particularly hot climates. If you want to ensure that your rate of ventilation is maximized, then you may find a backpack with perforated foam to be ideal; this is due to the fact that perforated foam can prevent the backpack’s rear panel from sticking directly to your skin, which could quickly generate uncomfortable heat in particularly dry conditions. A pack’s ventilation won’t have much bearing on the functionality of the backpack itself, but at the same time, it can mean the difference between an enjoyable hike and a completely unbearable one on the hottest trails. The most vital factor in handling long hikes is your level of comfort, and nothing has a greater effect on the comfort of a backpack than its weight distribution. Your backpack’s weight distribution during the hike will be largely determined by the hip-belt. Too much slack in hip belt will lead to inefficient load bearing, an overly tight hip belt can quickly create pressure in all of the wrong places. As a rule of thumb, the majority of your backpack’s weight should sit securely on your hips. Keeping the pack’s weight on your hips allows it to be distributed along your strongest bones. When choosing a backpack, take note of how much freedom you have to customize the hip belt for the exact fit you’ll need. In a similar fashion to the hip belt, the shoulder harnesses can be adjusted for optimal and nonoptimal weight distribution. Sizing is standardized by your back length, not between manufacturers, so the best course of action is to get your back measured in advance (roughly from your lower neck to the area directly above your hips). Once you have an approximate range of inches for your back length, you can measure that number against backpack sizing charts and choose accordingly. Picking the perfect backpack will require pinpoint accurate understanding of your personal hiking goals and travel details. The climate, the length of the expedition, and your own physical attributes can combine in many different ways to create the need for many different backpack configurations. Aside from the situational variables, the highest-quality backpacks will have generous padding, ample water resistance, and a high degree of customization to meet your ideal sizing needs. The more time spent locking down all of the relevant factors, the more you’ll be able to enjoy your hike to the fullest.